Philip Kingsley has saved my hair. A bold statement I know, but it is, without doubt, 100% true and there was no other way for me to start this post that with that sentence. Earlier this year I noticed that my hair was falling out, by the handful, when I washed it and while I was brushing it after washing. I won’t lie, I was worried, no one wants to see clumps of hair coming out each time you wash it, but I wasn’t (yet) in panic mode, as my hair is ridiculously thick and I have a lot of it. Had it continued like that for much longer though, I think things would have started to become a bit more urgent. 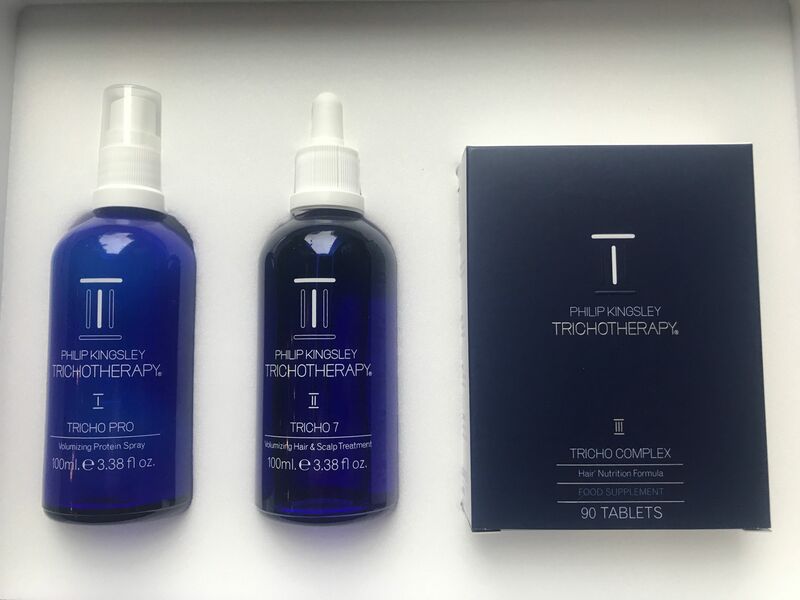 Luckily, through the mad and wonderful world of blogging, I got an email about some Philip Kingsley products in a press release, so I thought I would pick their brains and ask for some tips. Aside of advising me to make sure I was eating protein in each meal, and going through the supplements I was taking, they offered to send me the Trichotherapy Regime to try, as well as the world famous Elasticizer (there will be a whole other post on this product, as I love it THAT much). 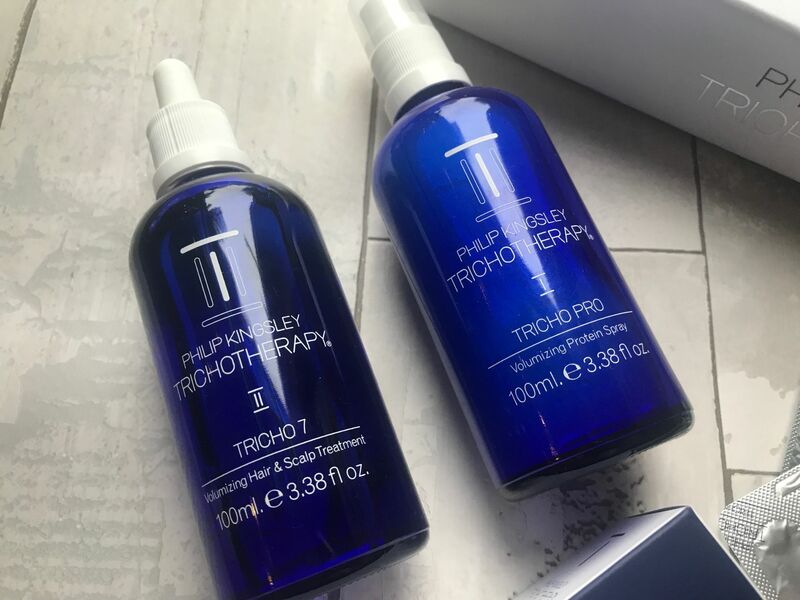 Philip Kingsley Trichotherapy is a holistic hair care kit with three products designed to work together to make your hair feel fuller, thicker and healthier. It’s a three step, daily regime, so it takes dedication and time, but if your hair is your crowning glory then it’s more than worth it. It works from the inside out to encourage healthy hair growth. This is rich in anti-oxidants and helps to moisturise and improve shine, fullness and strength in and around the cuticle. You have to use this daily, on clean, towel dried hair. Spraying through the ends and mid-lengths, and then combing (gently) to de-tangle. If you haven’t washed your hair that day, you can use this on dry hair to de-tangle and restyle but I think the best results are on clean, towel dried hair. Again, these are to be used daily, after the protein spray. They contain a combination of 7 ingredients that have taken years to perfect. It’s rich in anti-oxidants again, and immediately gives the effect of more volume in the hair. 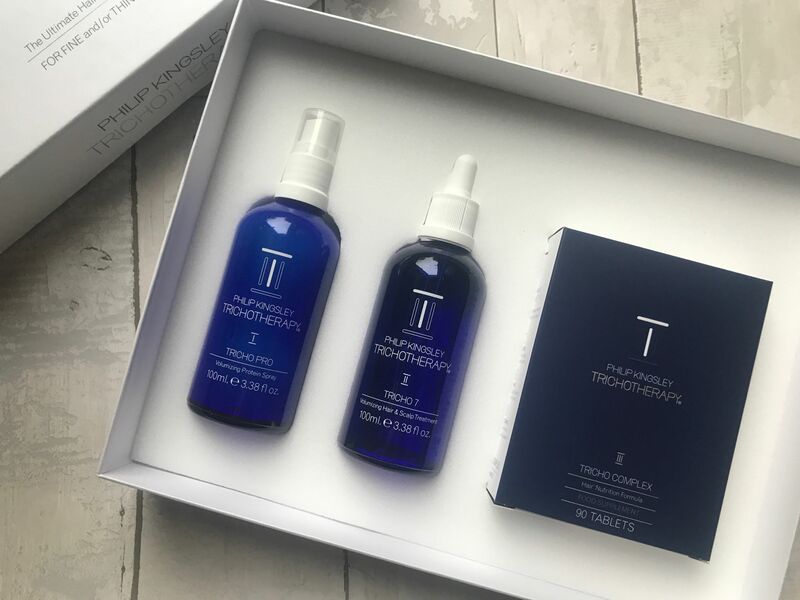 One of the ingredients is a vaso dilator which enlarges the scalps blood capillaries to improve circulation and help extend the growing phase – which to me sounds like it will help my hair grow longer, faster, and that makes me very happy. You apply this treatment using the pipette, you just need 2.5ml – each squeeze fills up to 0.5ml so you apply it across your scalp in 5 applications. It goes across the crown & front of the scalp. You then massage it a little with your fingers and that’s it. No rinsing needed. This part of the treatment is a bit trickier than the first, because it feels like the drops will run down your face/all over the place but just take your time tilt your head accordingly! The last in the three phase regime is the supplements. These contain a mix of vitamins and minerals, like Vitamin D3, C and B12. As well as amino acids, L-Lysine and iron. They also contain zinc, biotin and selenium which all contribute to the maintenance of normal, healthy hair. They even contain copper which contributes to normal hair pigmentation, and obviously I am praying that means my natural red will come back a whole lot quicker! You have to start off taking 2 tablets a day, one with breakfast, one with lunch and then after 4 months you can go down to one a day. The pack contains 90 tablets. I’ve been using this since mid November and already I’ve noticed a massive difference in the rate my hair has been falling out. 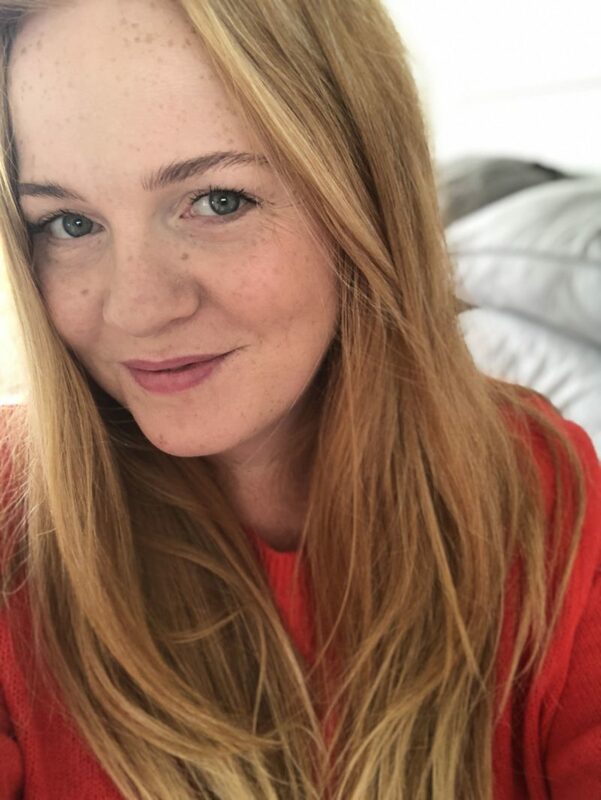 I think for me, the biggest change is the fact that I am paying attention to the scalp, which sounds obvious, but I’ve always focused treatments on the ends and lengths, because I’ve not wanted to make my hair greasy or over heavy. But by using three different products which target the insides, the hair and the scalp, there has been a huge change. 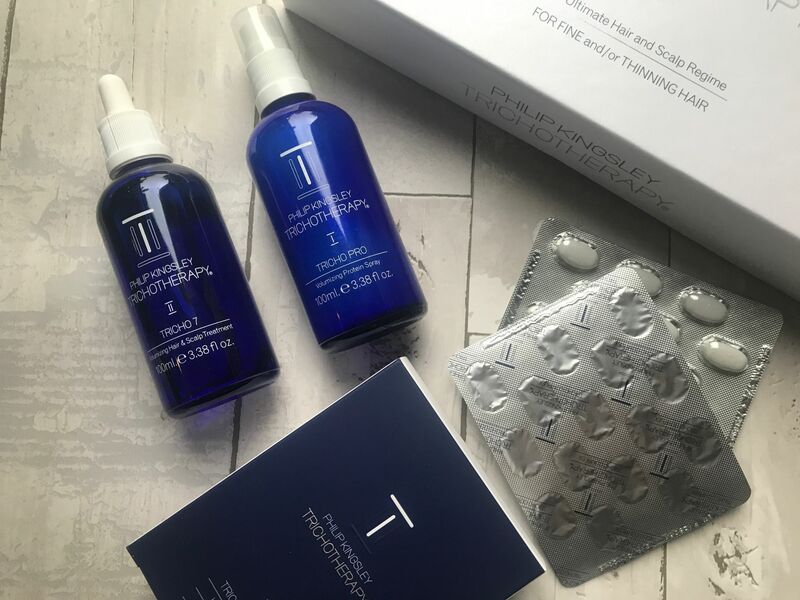 It’s not a cheap regime at £120 for all three, although you can buy the products individually from the Philip Kingsley website, but if you’re someone who is worried about their hair, or you’ve found yourself losing volume and strength then it is more than worth it. The system has to be used daily, with all three products for at least 12 weeks to see a difference, because of the hair growth cycle, but already, at just 6 weeks in, my hair is starting to feel like my own again, I’m convinced it’s grown quicker and it certainly looks and feels better than it has done for a long, long time. Next Post Your Pelvic Floor During Pregnancy // Work It!